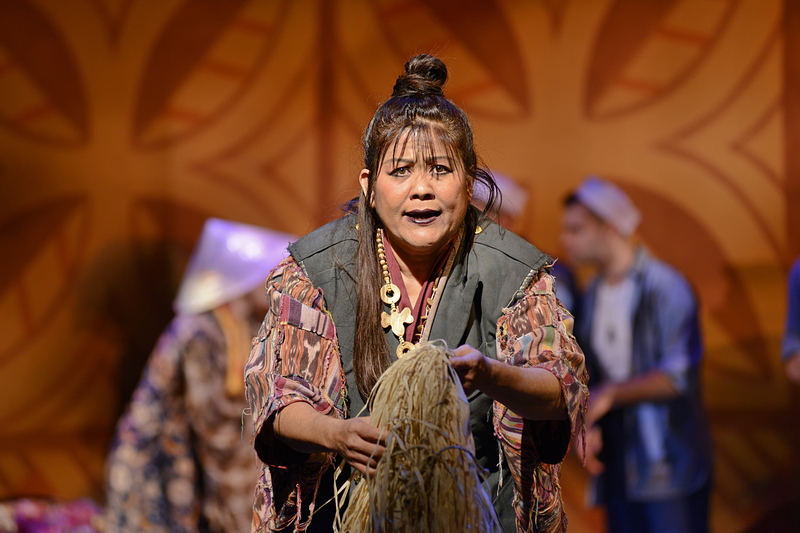 A ‘Bali Ha’i-Powered’ Experience: Nothing ‘Cockeyed’ About It–“South Pacific” Is A Show To Love In Long Beach, CA. Talk about “some enchanted evening”! Although “I expect every one of my crowd to make fun of my proud protestations of faith in” musical theater that can be fanciful and romantic while also remaining significant and socially-conscious, “Fearlessly I’ll face them and argue their doubts away” by asserting that there are few better ways to celebrate February’s season of love and valentines than with one of the most acclaimed stage romances of all time—Rodger’s & Hammerstein’s “South Pacific”! Thankfully, “Musical Theatre West” at “The Carpenter Center For The Performing Arts” in Long Beach California, has unveiled, precisely this show as their first of 2015! A rare and jubilant—but also important–entertainment, “South Pacific” made its debut in 1949, before going onto win numerous awards—among them, a Pulitzer prize, and it remains ranked amid only a handful of musicals to ever attain such an honor. This is conceivably due to its peculiar, timeless, quality; although set at the height of World War II, it especially speaks to our current situation today—maybe even more so than when it was originally produced, and you can rest assured that MTW’s latest production lives up to all of the show’s ‘enchanting’ merits. A true classic if ever there was one, I am definitely NOT in ‘a conventional dither’ when I state that Richard Rodgers and Oscar Hammerstein’s score is filled with practically one amazing showstopper after the next, and certainly all have become bona-fide standards in the canon of noteworthy American music. The book is also by Oscar Hammerstein and Joshua Logan (the show’s original director), based on James A. Michener’s Pulitzer Prize-Winning novel “Tales of the South Pacific” (–or more specifically, two stories within it.) The action takes place on an island (where else?) 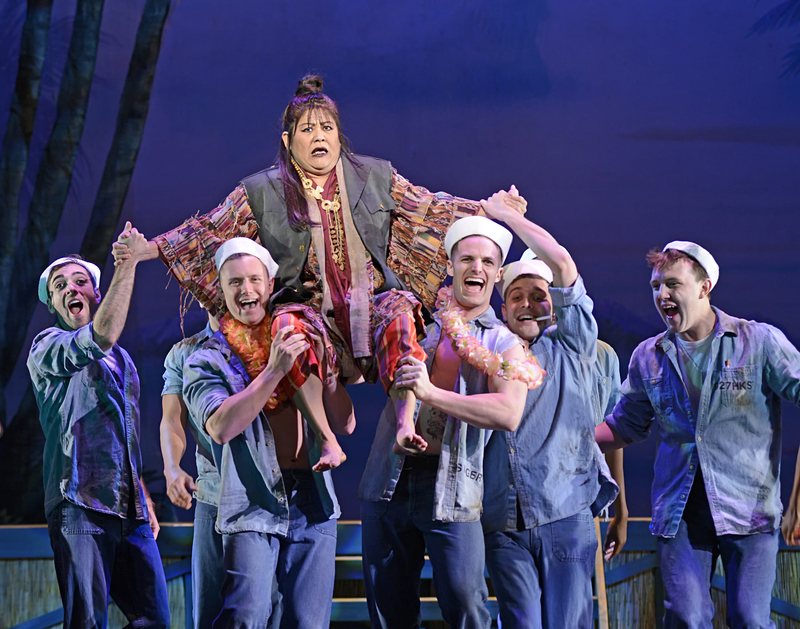 in the ‘South Pacific’, and concerns two romances that run parallel to each other with some comic relief thrown in. The first involves Navy nurse “Nellie Forbush” from “Little Rock, A-R-K”, who quickly falls for the slightly older “Emile DeBecque” after meeting him at an officer’s club dinner. DeBecque is a French expatriate and area plantation owner with (unbeknownst to Nellie) two small children by a previous relationship with a native woman. By the same token, idealistic newcomer to the island, Lt. Joe Cable soon finds himself entranced by a young exotic beauty named “Liat”, who is the daughter of “Bloody Mary”, a sassy local peddler around the Navy base. Caught between their blossoming courtships and the ever-looming reality of the war against Japan, both Forbush and Cable struggle to reconcile their (for the time) unconventional affairs of the heart with their own prejudices and insecurities. With direction and choreography by Joe Langworth, who himself was the Associate Choreographer of the hit 2008 “Lincoln Center” revival, there’s a refreshing, unforced, quality running through the entire production that speaks to both the strength of the material and the commendable talents of those performing it. When it comes to dances and group achievements, Langworth saves most of the really clever moves for the scene-changes and brief ‘in-one’ segments, but perhaps by reason of their very brevity, these sequences truly charm and enliven thanks to some rather sharp moves and acrobatic exchanges. Examples of his imaginative terpsichorean craftsmanship include an ingenious combination “mariner’s horn-pipe/jitterbug’ for the sailors as part of their big “Bloody Mary” number (–which, not coincidentally, earns one of the most prodigious ovations of the evening!) Subsequently thereafter, the “Seabees” earn still another hearty round of applause for their efforts with, “There Is Nothing Like A Dame”; by the time the second act is unveiled, it’s the ladies turn to bask in the spot-light as they reignite the goings-on with an energetic, burlesque-inspired kick-line performed as part of the stylish gag-number, “Honey Bun”. Broadway’s Alessa Neeck stars as the wide-eyed, “Cockeyed Optimist”, Ensign Nellie Forbush, along with Christopher Carl—likewise an artist of some note along “The Great White Way”, who appears as the French Planter, Emile DeBecque; together, Neeck and Carl make a handsome, not to mention very melodic, on-stage couple whom viewers won’t find it hard to ‘root’ for. Ms. Neeck’s portrayal emphasizes Forbush’s small-town southern upbringing and she even throws in an appealing southern lilt to her voice. Her opening, “Only A Cockeyed Optimist” is conveyed simply but cheerfully, while shortly after, her take on “Gonna Wash That Man Right Outta My Hair” is a sheer delight, starting off as a solo, but quickly erupting into a full-on lively dance-interlude with all the nurses; then, her abrupt romantic ‘about-face’ with “I’m In Love With A Wonderful Guy” (including its encore) is yet another authentic highlight this lass really delivers on! Meanwhile, Mr. Carl’s appropriately deep and resonant voice is one to fall in love with, and his rendition of the iconic “Some Enchanted Evening” early on is the evening’s first full-fledged show-stopper, but it isn’t until the second act with his lamentation “This Nearly Was Mine” (—complete with the song’s seldom heard ‘bridge’,) that the pure profundity of this man’s ability to instill raw emotion into what he’s singing is completely felt. 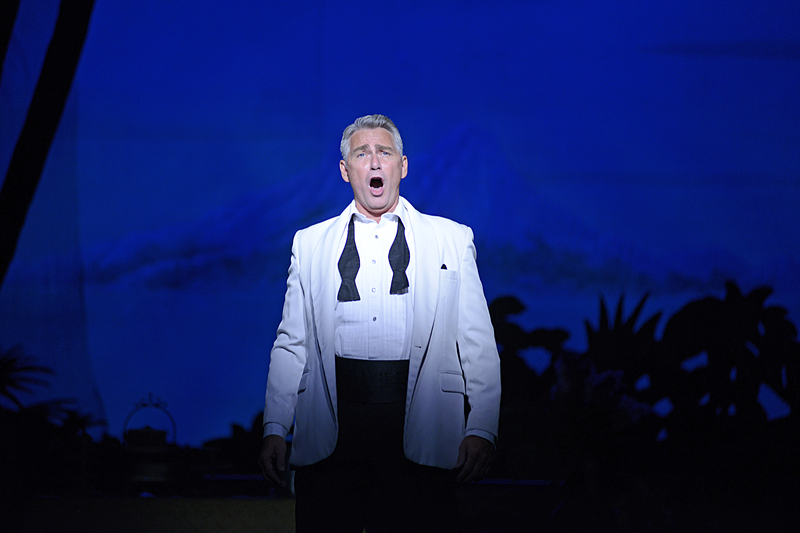 Joining them is Patrick Cummings from the San Francisco Opera as Lt. Joseph (Joe) Cable. Gifted with a rich tenor voice, in keeping with the over-all style of this production, he begins his alluring chanson, “Younger Than Springtime” (sung just after he’s met and become thoroughly enamored with Bloody Mary’s daughter,) softly enough, but gradually lets it build into a tremendous crescendo that reveals the ample might of his striking vocal talents! Similarly, his rendering of “You’ve Got To Be Taught”—which spells out the primary message of racial acceptance for “those whose skin is a different shade” that “South Pacific” proclaims, is initially kept low-key, steadily building to a passionate apex filled with recrimination—against himself and the “society” he was brought up in. The production also incorporates a first-act duet between Nellie and Joe titled “My Girl Back Home”, which was cut from the original 1949 staging, but later reinstated for the 1958 film. Here, it deepens the understanding of the pair’s deeply entrenched mind-set toward race-relations that they grew up around, and each are impressive in presenting it. 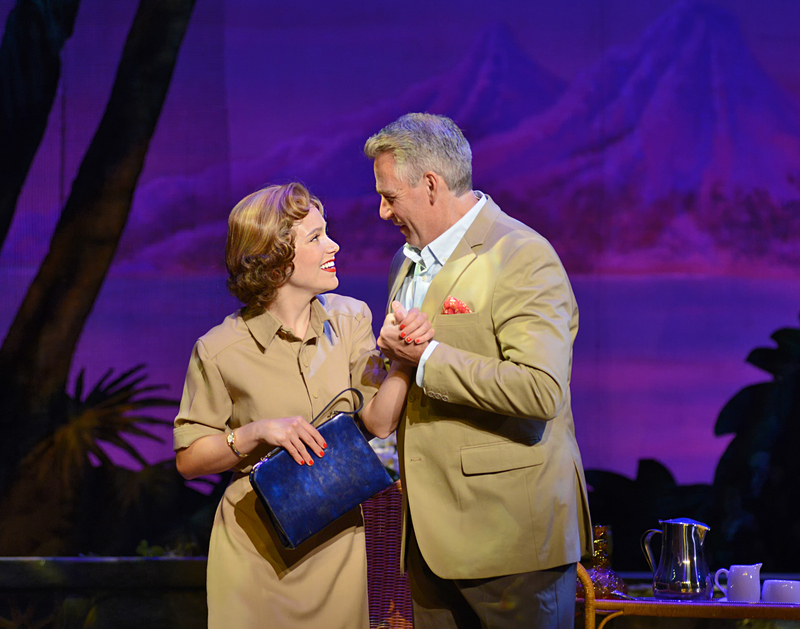 “South Pacific” also features several remarkable character roles, and here too, they don’t disappoint! Jodi Kimura, furnishes laudable support as “Bloody Mary”. Kimura offers us a much more relaxed, honest and unaffected ’person’, and less of a caricature than “Mary” is all-too-commonly seen as. This doesn’t mean, however, that she doesn’t vocally bestow the goods where it counts though. Her interpretation of “Bali Hai” is full and seductive as the song should be, while her supposedly ‘upbeat’ second act ditty, “Happy Talk” (sung to a malaria-weakened Cable) has an intriguing tinge of desperation also strangely befitting the situation, as shortly following, Joe will announce that he is unable to marry her daughter. As that same vulnerable young lady “Liat”, Cailan Rose also manages to stand-out nicely in a frequently overlooked role, depicting her as a fresh-faced and innocent ingénue who is easy to empathize with. Although dialogue-wise, she may not have much to say, Rose nonetheless makes her mark with a whimsical little dance-solo performed as part of her ‘mother’s’ breezy melody, “Happy Talk”. 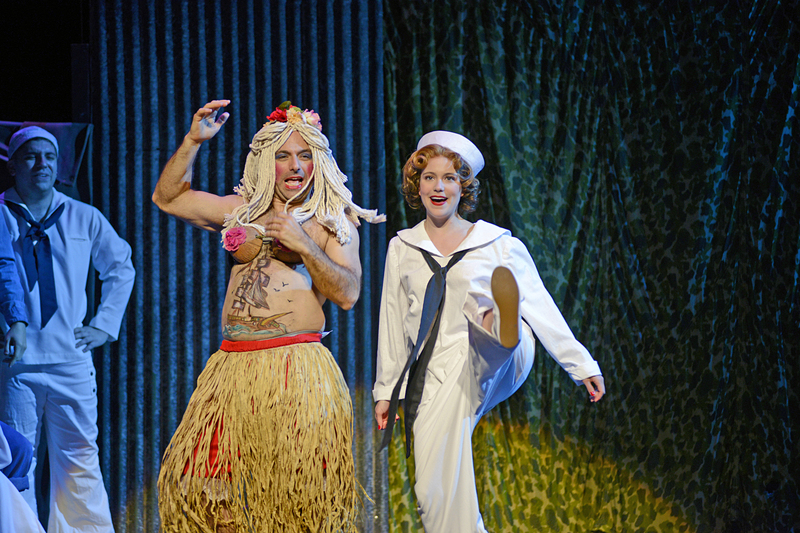 Spencer Rowe also does an exceptional job providing many rib-tickling moments as the tattooed Seabee Luther Billis. Proprietor of “Luther Billis Enterprises” (among other things,) he’s the character that ostensibly connects all the stories as he’s pretty much connected to all (or at least, most of) the lead players. In addition, his various antics go a long way in lightening the mood of what could, at times, be a fairly heavy show. Moreover, listen for Melvin Ramsey as “Seabee Kenneth Johnson” to supply some dramatic low notes at the end of “Nothing Like A Dame”, as well as some equally formidable foot-work during the choral reprise of “Bali Ha’i”. Given the day and place that the events in this story are set against, in an exhilaratingly dignified gesture of gratitude, on opening night Executive Producer, Paul Garman asked all the actual Veterans of WWII in attendance to rise and be acknowledged for their service, at which they readily received a rousing round of applause! Indeed, this patriotic salute would later be reinforced immediately after intermission, when omitting the entre-act, the cast requested audience members to stand and join them in singing the National Anthem. Not only did this unexpected bit of spectator-participation inaugurate the second-half in an elegant and spirited way, it also further reinforced the era the show occurs in: the first scene in Act Two begins during a “Thanksgiving Program” on the military base, where just such a tradition would be observed! “The Carpenter Center For The Performing Arts” is on the northern end of the campus of “California State Long Beach”, located at 6200 E. Atherton St. in Long Beach, CA. Don’t wait and later lament “This Nearly Was Mine”—get your tickets now! 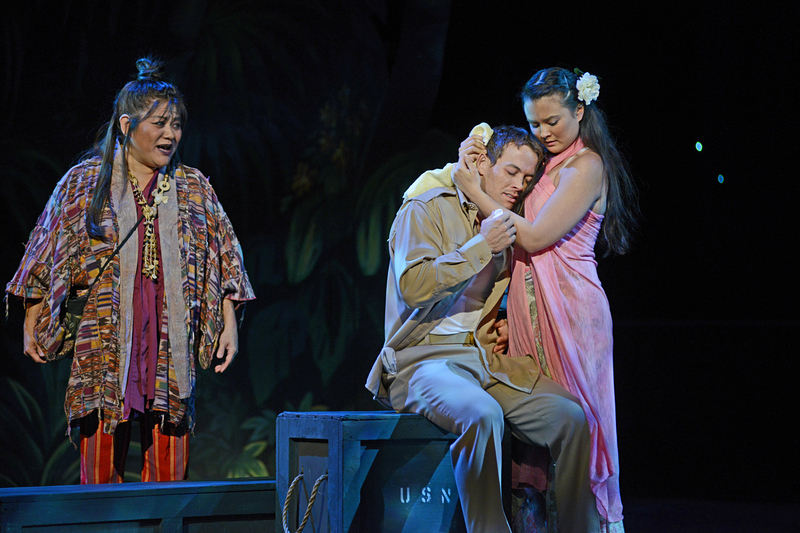 Having opened Saturday, February 14th, “South Pacific” will play Fridays at 8:00 PM, Saturdays at 2:00 PM and 8:00 P.M, with Sunday matinees at 2:00 PM, through March 1st. Special added shows are on Thursday, February 26th at 8:00 PM and Sunday evening 22nd, at 7:00 PM; Tickets are available by visiting the “Musical Theatre West Ticket Office” at 4350 E. 7th Street, Long Beach CA., by calling (562) 856-1999, ext. 4, or online by logging onto: www.musical.org. Production stills by “Caught In The Moment Photography”, Long Beach CA. (www.caughtinthemoment.com) Courtesy of “Musical Theatre West”; Special Thanks to Paul Garman, Lori Yonan, and to the cast and crew of “Musical Theatre West’s” “South Pacific” for making this story possible. This entry was posted in Theater reviews and tagged "South Pacific", "Tales From The South Pacific", "The Carpenter Center For The Performing Arts", 1949 Tony Award Winning Musicals, 2008 Lincoln Cnter Revival, 2008 Revivals, Bali Ha'i, Bloody Mary, Classic Musicals, Emile DeBecque, Honey Bun, I'm Gonna Wash Tat Man Right Outta My Hair, James A. Michener, Joe Langworth, Joshua Logan, Liat, Long Beach CA, Long Beach California, Lt. Joe Cable, Luther Billis, Musical Theatre West, Nellie Forbush, Nothin' Like A Dame, Oscar Hammerstein II, Pulitzer Prize Winnning Musicals, Richard Rodgers, Rodgers & Hammerstein, Some Enchanted Evening, Souther California 2015 Theater Season. Bookmark the permalink. Well-written review. Anecdotal without being condescending. Guide for other reviewers to follow!